I know his is simple, but it's my first projector for furniture going in the house. This is a twin size day bed. Originally I was planning to do a cross board also and have 4 panels, but I also need to speed up the project and curious of feedback with just the vertical and 2 panels. I will route out a slot for the panels, but for now it's just laying on plywood to give an idea. And of course any other suggestions or feedback. The top cap is just to show that there will be some sorts of cap on top. As of now the plan is to paint. Should I sand individual peices or assembly then sand? It is hard to gage size in the photo and this may be personal preference but, the height seems too tall. Be sure to consider the height of your mattress and box spring as this can dramatically affect the overall appearance (not to mention getting in and out of the bed). Consider a taper or other detail on the lower portion of the legs to give a lighter appearance to the assembly. Definitely sand before assembly but be sure not to affect the joinery. You might want to chamfer the corners of the rails and perhaps the legs to soften them a bit. A 1/8" chamfer with a bearing-guided bit in a router is easy to do. Nice to see you are proceeding with this. it's been awhile! You may only want 1-mm radius which is 180 grit and a few gentle rubs. Should I sand individual pieces or assembly then sand? I would sand it all first, or you will need a corner sander. If you are hemming and hawing between painting and staining, then why not investigating doing both? That could look pretty nice. I would definitely do all the finish on the panels before the glueing up. If it goes where there are kids, food, wine or tea, then some slick/gloss finish will aid in cleaning. That project is starting to come together. While I call this a daybed, it might not be. I called it that because the headboard and footboard will be the same and the bed is intended to go with the long side of the bed against the wall, not the headboard. It's a twin size bed for my daughter in her bedroom. I do plan to route off the edges for style and to soften it a bit and make it less of an injury maker. 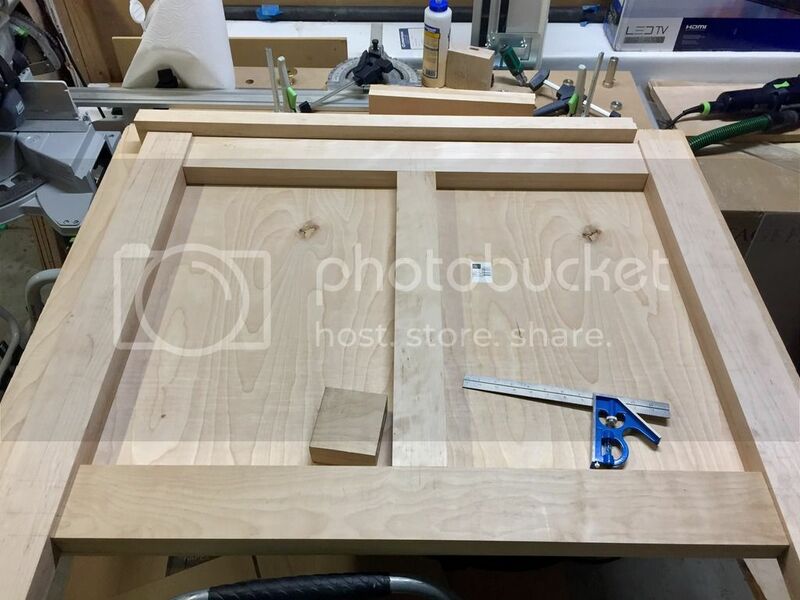 I was planning to route out a groove all the way around for the plywood panel to sit 'centered' in the cross beams, so that the style of the headboard is the same on front and back. Any tips on doing this? I would mark it all up, dry assemble it and check that the marks are aligned. You could use the plunge saw even and clean it up with a chisel at the ends. You either want kiddy proof paint (cleanable), or have her to help brush it on, if she is older than 3 or 4. Yeah it'll look bad, but it will be hers and she'll love it.